Apple last week refreshed its iPod touch lineup with a new 16GB model that offers a camera and color options to replace the stripped-down model it introduced last year. 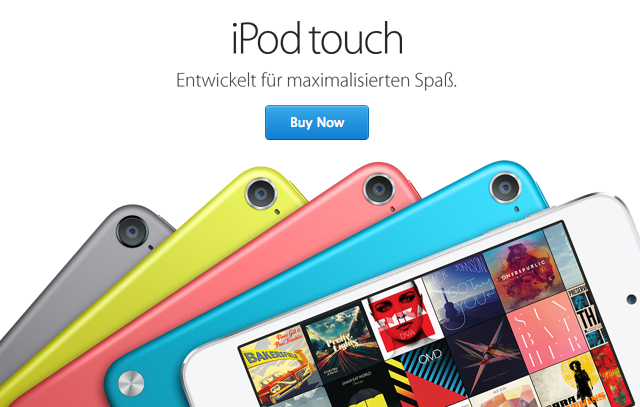 After debuting in the US, the new iPod touch today became available internationally, landing in the UK, Germany, Italy and other countries worldwide. As revealed by iFixit, the new 16GB iPod touch is a lower capacity model of Apple's existing fifth generation iPod touch lineup that was introduced in 2012. The model features a 4-inch display, Apple's A5 processor, a 5-megapixel iSight camera and color choices that include yellow, blue, pink and more. The new 16GB version lowers the entry-level price point to $199, down from $229 for the now-discontinued silver-only model. Apple traditionally refreshed its iPod lineup during its annual September press event, which often focused on iTunes and music. Apple de-emphasized music in 2013, opting to unveil the iPhone 5s. The Cupertino company is expected to continue this trend in 2014 with the possible unveiling of the 4.7-inch and 5.5-inch iPhone 6. The future of the iPod line remains unclear as sales of the units continue to slide quarterly. With the exception of the protruding camera, I find the iPod touch to be the most beautiful device in Apple's current lineup. When something like this happens on another device the editors of this website do not say that the device has been upgraded but they do when it is the iPod Touch. WHY? This is TWO times in a row that the editors have said that the iPod Touch was updated when it was not. I have never seen this happen with any other Apple product on this site. This isn't an upgrade. Come on MR, change the recommendation to don't buy. The last time the iPod Touch was actually upgraded was in the fall of 2012. While it isn't the innovation we were looking for, I'm sure we could all appreciate a lower price point. Now if only they still offered black/silver...I really liked the colour, just wished it had a camera. Do you live by numbers? Can you tell the real world difference? So much innovation that I just can't stand it. Samsung must be rolling over dead jealous of the outlandish creative thinking. Whoa look at the stock soar! If you pay RRP. Waitrose had the 16GB variety for £79.99 about a month back and I have often seen it on various offers at Amazon under a hundred. The Nano is way overpriced for what it is, especially as Apple's audio reproduction is mediocre at best. Agreed, Nano should be dropped down to $99 with a $149 32gb option at this point. I think the price point for the iPod Touch is fair and I'd probably get one for my 10 year old (she has a 4th gen) if the camera was just a little better. At this point IMO Apple should market the iPod line as a music AND life recording device. I know they would never do this but if they kept the same form factor, stuck in the A7 and increased the camera to 8-12 MP with OIS they could easily market the entry level model at $299 w/16gb ($349 for 32gb etc). The key here is that it's a life recording device without a contract that also plays music, videos and apps. Kids love cameras and with iOS8's camera features this would be the best way to market the iPod in the future. Too bad I don't think Apple has any faith in the iPod line anymore and the 5th Gen is the end of the line.